Garçon à la pipe was painted in 1905 when Picasso was 24 years old, during his Rose Period, soon after he settled in the Montmartre section of Paris, France. The oil on canvas painting depicts a Parisian boy holding a pipe in his left hand and wearing a garland or wreath of flowers. Early preparations of this work involved positioning the boy in all types of poses that involved standing, sitting or leaning against the wall. After much repositioning of the model, Picasso decided to go with the boy sitting down. Next was how to position the arm, where much time was also spent on the height and angle. Early works do not show any objects other than a pipe being used.Although Picasso started to paint this picture, he gave it a rest period for about a month. 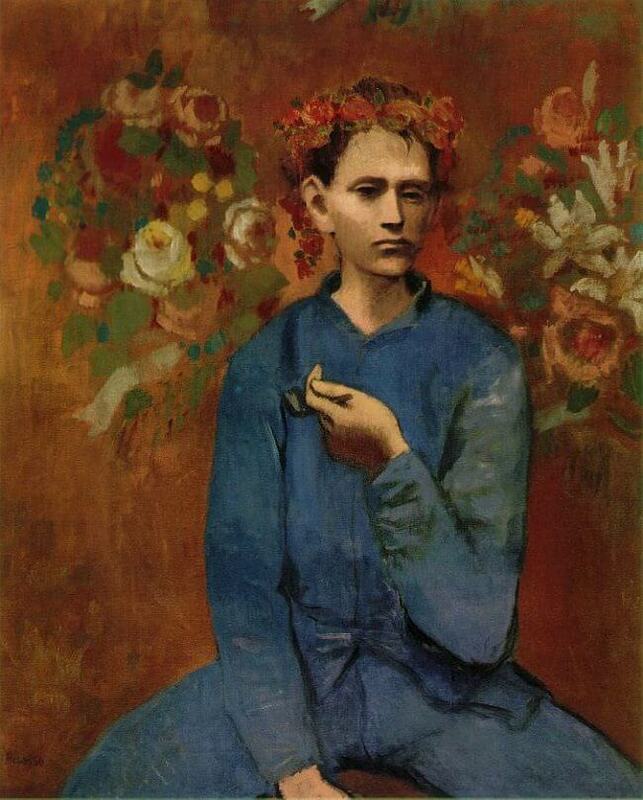 During this time, Picasso decided to finish it off by placing a garland of flowers on the boy's head. Le Bateau-Lavoir in Montmartre is where Picasso was living when he painted the picture. Some of the local people made a living in the entertainment industry, such as being clowns or acrobats. Picasso used many local people in his pictures, but little is known about the boy in the picture. From this comment, suppositions can be made. The first is that Picasso did not want people to know who the boy is, and the second is Picasso did not really know the boy. The painting was first bought by John Hay Whitney in 1950 for US$30,000. On May 5, 2004 the painting was sold for US$104,168,000 at Sotheby's auction in New York City. Sotheby's did not name the buyer though sources say that it was Guido Barilla, owner of the Barilla Group. At the time, it broke the record for the amount paid for an auctioned painting (when inflation is ignored). The amount, US$104 million, includes the auction price of US$93 million plus the auction house's commission of about US$11 million. The painting was given a pre-sale estimate of US$70 million by the auction house.